At Florence Melly Community Primary School, we believe that physical education and sport play a crucial role in improving our pupils’ physical wellbeing and lifestyles. We continue to offer a highly effective PE programme and build on the embedded sporting culture in our school through a well planned programme of action to promote participation, progress, achievement and enjoyment. making additional and sustained improvements to the quality of PE and sport in our school. developing and adding to the PE and sport activities that we already offer. building capacity and capability within the school to ensure that improvements made now will benefit pupils joining the school in future years. the engagement of all pupils in regular physical activity. the raised profile of PE and Sport across the school, driving whole-school improvement. increased confidence, knowledge and skills of staff in teaching PE and sport. the broader experiences of a range of sports and activities offered to our pupils. 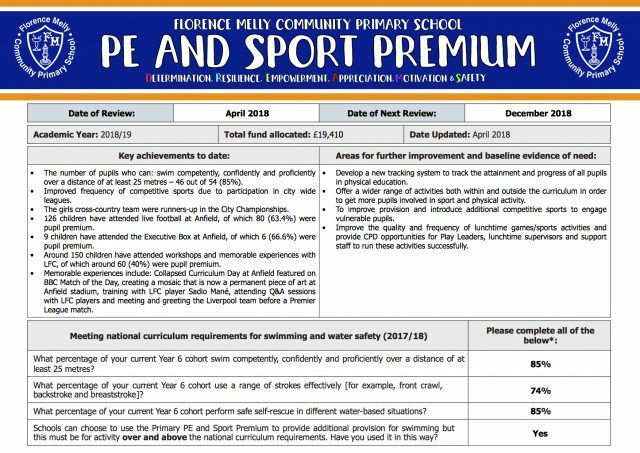 We evaluate the impact of the Sports Premium Funding annually and measure its impact on pupil outcomes. Please find below a copy of the school’s funding allocation for 2016/17 which provides a full breakdown of how the money was spent, a statement capturing the impact on the pupils’ PE and sport participation and attainment and how the improvements will be sustained in the future. In February 2017, the Ofsted team during their inspection recognised that our school spends its Sports Premium Funding effectively: “The government’s funding for school sport and physical education is spent well. For example, specialist coaches deliver gymnastics and dance in school and pupils have access to a range of sporting opportunities” (Ofsted Report, 2017). The report also commented on the abundance of extra-curricular sporting activities offered to our pupils: “Pupils have the opportunity to take part in a very wide range of extra-curricular activities including football, dancing…Pupils say they enjoy these opportunities because they help contribute to a healthy lifestyle” (Ofsted Report, 2017). As a school, we have further strengthened in this area by recently changing our PE Subject Lead. Due to long-term absence, the former PE Subject Lead was replaced to ensure the high expectations in PE were maintained and the strengths built upon. We have worked closely with the Head of JM Education and their specialist coaches to provide expert support in gymnastics and dance to provide CPD for our staff who deliver PE across school. This has resulted in our school making additional and sustained improvements to the quality of PE and sport in our school. JM Education have helped plan a comprehensive scheme of work and support staff to deliver lessons confidently. They have also helped develop the assessment of the children’s progress in physical education. We are currently working on a traffic lights system for assessment in line with the school’s assessment policy for all other curriculum areas. JM Education also take extra-curricular, after school clubs to provide our children the opportunity to learn and enhance their skills across a range of sporting disciplines. By working closely with JM Education, we have built our capacity for sustained improvement and have ensured that improvements made now will benefit pupils joining the school in future years. 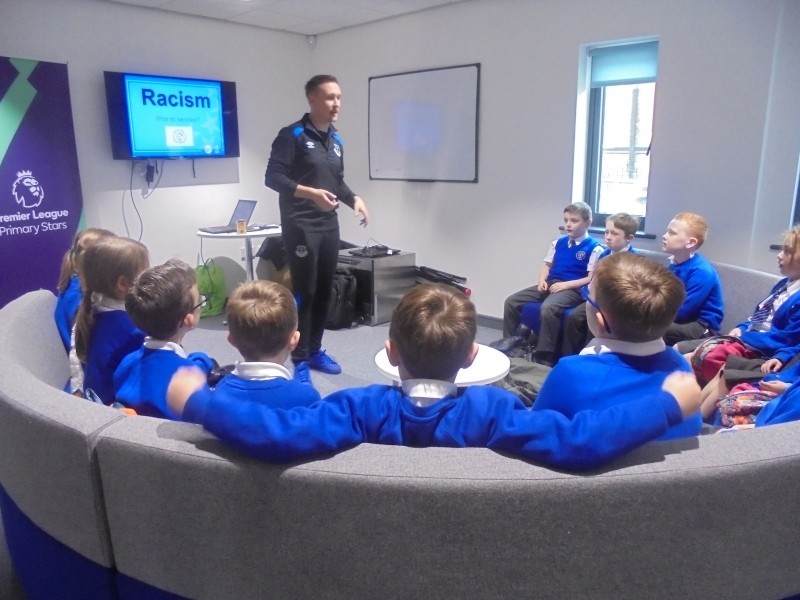 We continue to have strong community links with Liverpool and Everton Football club whereby we have ensured increased participation in competitive sport. Frequently, children are taken to compete in football matches organised through the clubs. Competing against other schools has helped provide broader experiences for our pupils and we ensured that children who do not play for teams outside of school were given the opportunity to compete for the school. This approach proved highly effective. 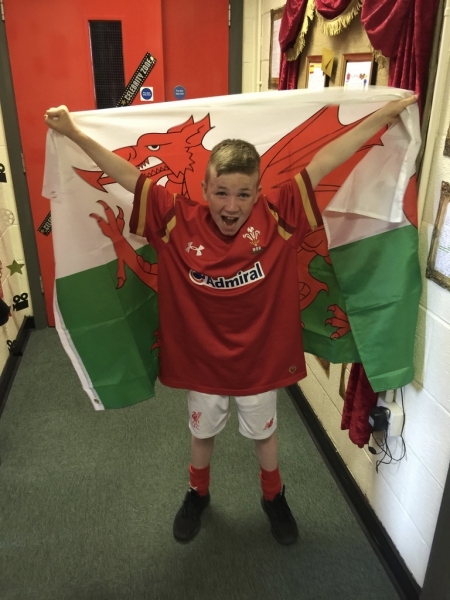 This was captured during pupil interviews: “Mr Doyle picked me for the football team. I had never played for the team before and it was great fun. We won and I cannot wait to play again”. In 2016/17 the Sports Premium Funding helped us to develop and add to the PE and sport activities that we already offered. We provided successful after-school clubs to children across the school in: badminton, netball, basketball, cross-country, athletics and football. These were extremely popular and many of the pupils who attended these clubs also represented the school in city wide competitions. For example, the school won a number of cross-country races and had an individual pupil compete in the City Championships and was amongst the best athletes in the city. 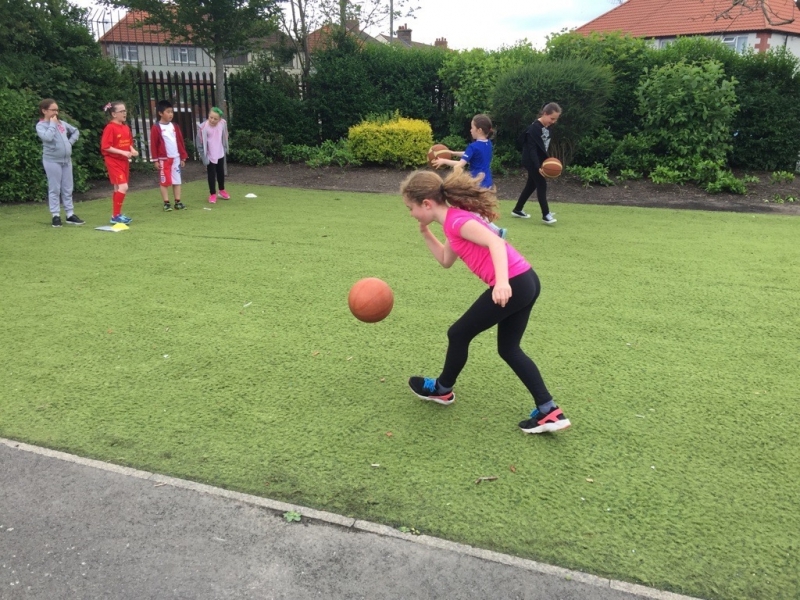 We also provided multi-sports clubs for our younger pupils which were well attended, with over 20 pupils attending every week, and were thoroughly enjoyed by the pupils. 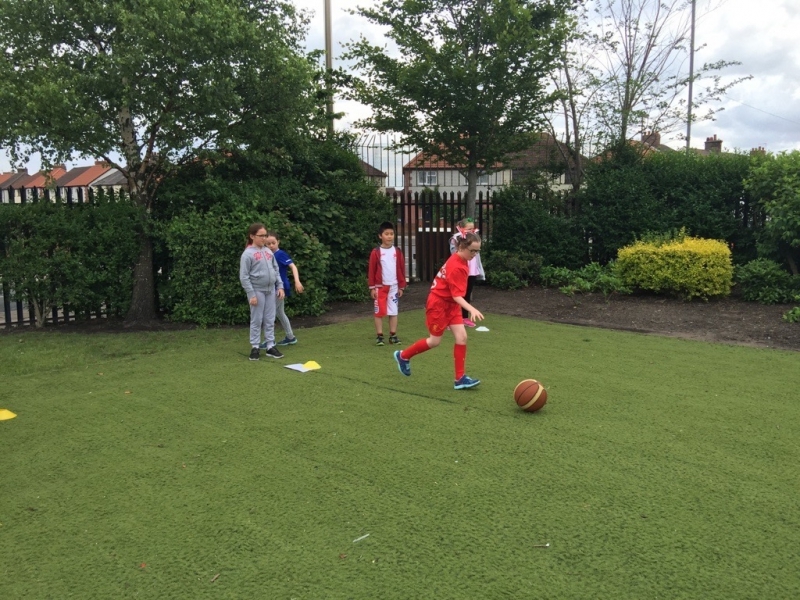 When conducting pupil voice, one KS1 child commented: “I loved playing all the different sports, it was so much fun”. We also ensured that our pupils participated in the Year 6 swimming top up programme whereby we have successfully raised pupil standards in swimming and increased the percentage of pupils who can swim. This support was targeted, after an analysis of pupil performance as part of their entitlement to National Curriculum swimming. Our Sports Premium Funding has helped our school proved broader experiences of a range of sports and activities which our pupils would not normally have access to. For example, some of our pupils participated in Zorba football and trampolining.